We talked to graduating Highland Capital Management Tower Scholar Bradley Potts about his SMU experience and his goals for the future. Bradley is majoring in Political Science and Business Management, in addition to earning the Tower Scholars Program minor in Public Policy and International Affairs, and after graduation he will attend law school. Being from Louisiana, what drew you to SMU? With one of fastest growing economies and populations in the country, the city of Dallas is full of fantastic opportunities, and I knew that I wanted to be a part of the city. As Dallas’ premier institution, SMU was naturally a great option for me. SMU’s extreme focus on the student experience and emphasis on undertaking multiple degrees of study then made the school one of my top choices. You’ve mentioned that at some point in your career you want to teach at a university. How did that become one of your goals? Throughout my life, I have had a profound enthusiasm for learning, problem solving, and empowering others through understanding and information. This enthusiasm inspired my initial interest in an academic career. 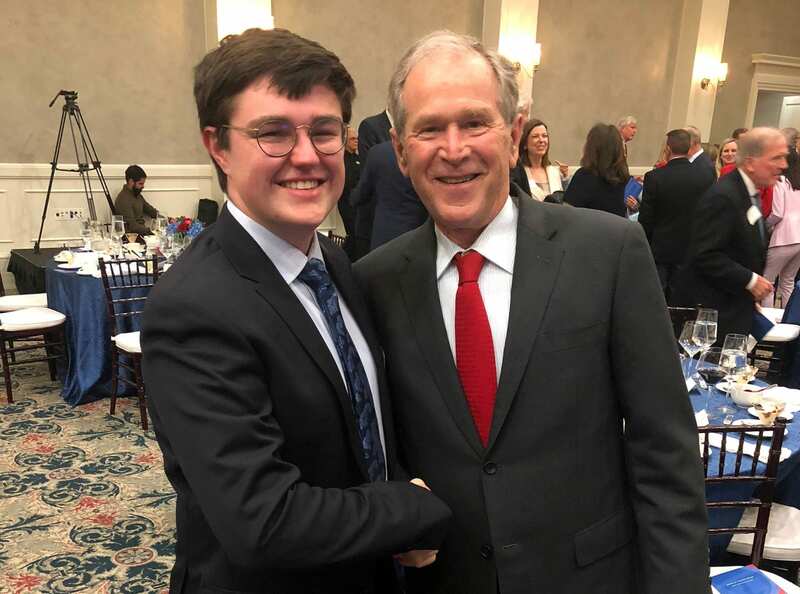 However, while at SMU, the relationships that I have had with my professors, especially in the Tower Scholars Program, allowed me to understand the special impact that professors have both in and outside the classroom. As mentors to students, professors can significantly influence their students’ career decisions and intellectual growth, and outside the classroom, their research and practical work can be significant in many ways. How has the Tower Scholars Program impacted your SMU experience? The Tower Scholars Program has been formative in three ways. First, it has provided me with the analytical and problem solving skills to feel confident in addressing problems. Second, the program allowed me to meet and network with influential individuals and groups in the SMU community and Dallas area. I am confident that these relationships will help me throughout my career. And, third, through the Junior Year Policy Seminar working with Microsoft and my Senior Practicum Project with the Lone Star Policy Institute, I learned critical organization, time-management, and team-management skills that will serve me throughout my time in law school and in my career. You have been accepted to some stellar law schools. What advice would you give to students who want to follow in your footsteps? There are four things that I wish somebody would have told me when I was a first year at SMU. First, get involved with something as early as possible in your college career—even if it is just one organization. Early involvement will allow you to acquire substantial leadership positions in you upper class years. Second, form relationships with your professors. While these relationships will of course be good for personal growth, they will also assist you in acquiring letters of recommendation and conducting independent research with faculty supervision. Third, though it is unfortunate, the importance of the LSAT and GPA cannot be overstated. Applicants’ LSAT and GPA are by far the most important parts of their applications; research law schools’ median LSATs and GPAs to understand what is expected. And, fourth, demonstrate diversity of thought and intellectual capability by studying dissimilar academic fields. For instance, if you have one major in Dedman, pick up another major or minor in a different college such as Cox or Lyle, while also combining these fields through research or an interdisciplinary program like the Tower Scholars Program.